He came across the other, this about a quarter of noon, lying upon a fallen tree. He hopped on over to this buffoon to egg him on, to get his daily taunting over and done. The sun wasn’t as bright as some days had been in the past; however, the day was simply another day, and there would be more in the future. The surrounding trees looked flat and pale; the environment was seemingly fading instead of glowing or growing more vibrant. Something would have to be done for the future, the daydreamer thought aloud. At the same moment, the approaching wanderer reassured himself with a soliloquy, This is all out of love, despite his eager anticipation to get the rise. His fellow had sat up from lying down while eating an apple, and he was wearing the same brown pants and green shirt so often worn in the past. As he hobbled in closer, he announced, Looking like you fell into vomit again, I see. There was a pause, but there was no laughter to fill the void. He stopped, his joints buckled a little bit in disbelief. You’re looking pretty shabby yourself, the dreamer noted. Using the hand with the apple, still gripping the object, he pointed over in the direction of his friend. That mustard shirt is looking pretty ratty, tarnished. The red pants, you clown, are quite frayed at the ankles. A couple small giggles rose from this comment. He leaned back with his elbow into the bark, propping his body up. Clown! Good one! What brings you out to this horrid place again? It surely isn’t the creatures, and those animals have since scattered. The wanderer placed his hands upon his hips, cockily. He raised his right hand in the air with one smooth swing and extended his fingers to display an open palm. With an invisible tray, he would serve his friend well. I do believe you owe me an apology It’s best to cut to the chase. An apology? For what, may I inquire? My wife. You see, she has been acting quite distant lately, and at first it was hard to determine as to why. You really want to bring this up here, the dreamer simply stated. Now is definitely not the time. His voice trailed off as a result of his thinking. I’m quite enjoying the day, this apple, you see? It’s required, personal time, to often reflect upon life. Such trepidation will only hinder a process. The wanderer placed his hands upon his red knees. Oh, try not to use such big words. You’re entertaining the child’s mind, and speaking with such eloquence, code, can only create more controversy. The dreamer looked at his apple. The mind of a child, you have, indeed. Should I choose to pick up a rock, you’d best be in for trouble. Oh, just shut up! The wanderer interrupted and bounced without grace over to his antagonist. The wanderer remained unfazed, not moving from his position upon the fallen tree. With such haste, his mouth fell open without his genius noticing it. And what are we going to do? Shut your mouth, my good man, before you begin catching flies. A giggle rang with such amusement. Reluctantly, the offer to sit was accepted. Wanderer took a seat. There is bread baking in the oven. I bet it smells delicious! Dreamer tried to wear the best smile on his face. I’d sure fancy to have a slice once it is ready. Once it’s ready?!? Are you daft? You already have had a piece for I know! Why should I be calm? You’re my friend… at least I thought you were! Listen, that bread does not have my name on it. There is some absurdity in all of this, but my involvement is nowhere to be found. Wanderer’s face remained unchanged, plastic. You best be telling the truth. There has been no preparation in months for the bread to be made, baked, and pulled out. Definitely no pulling out, Dreamer muttered. Can you be serious for one goddamn moment?! Wanderer continued. This is not a joking matter, you buffoon. Dreamer simply raised the apple to his mouth. Have you nothing to say? That damned fruit is glued to your hands. You cannot actually eat anything if it’s not real. The Dreamer stopped his friend. Pardon me, but this apple is as real as you make it out to be. It’s not by choice this such object is stuck to my palm. That’s the magic of wonder and storytelling. If I am going to eat an apple, I’m going to eat an apple. At least I don’t look like a hot dog smothered in ketchup and mustard…moldy mustard. At that moment Wanderer dove at Dreamer with slow spontaneity, but the marionette’s puppeteer did not see the advance coming. The Wanderer’s controller, at the same time pushed the palm of his free hand into the face of his fellow performer, who did not anticipate his friend’s accosting. The scuffle turned into slapping and fending off each other, which was emulated precisely by the puppets in their hand. The strings of the entertainment soon became tangled, and the duo, who baltered awkwardly. As their faces clunked together, as their appendages slapped and free limbs flailed, as the apple was attempted to be inserted in an uncomfortable place, the disorderly scenario in the once quaint woods was admired and entertained by the children sitting below. 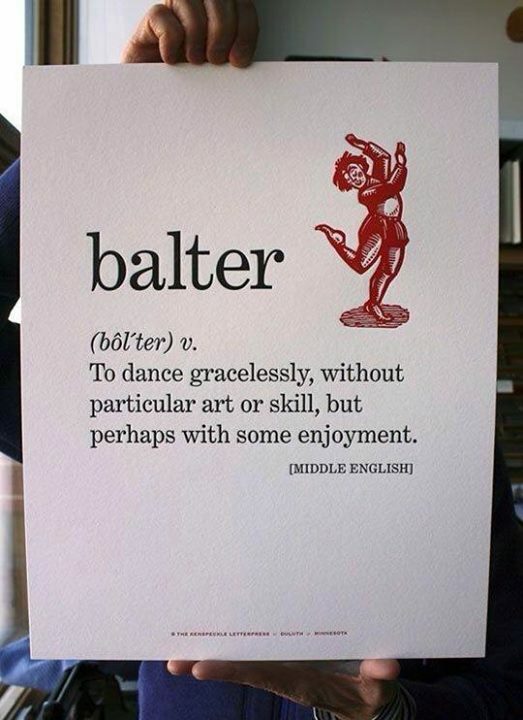 Never falter, do not alter, pray at the altar, first time I ever saw a blog use the word balter. I just did a dance in my living room that was quite artless but teeming with enthusiasm. Nice story, Chris. Thanks for commenting as always. Hope you week is going well, sir. I was smart enough to bust the balter when dear wife Karen was at work, Chris. No fool I in that one.